Ladakh is a place of immense beauty and I might be biased but of all the hill stations I have visited in India, Ladakh was the one that still took my breath away on many levels. My trip to this cold desert was unplanned and an impromptu one. Aman, from ‘High Mountains’ called up in the month of June to ask that ‘Hey, is Ladakh still in your bucket list?’ and I was like ‘Of course it is’. So off I was, onto a crazy adventure amidst the mountains of Jammu, crossing river streams, driving on rugged roads and getting lost in the serene valley of Himalayas. If you want to go to Ladakh on your own, you can check out our Ladakh itinerary with route maps. Our journey started on June 28 where ‘High Mountains’ arranged a Volvo bus for all the travellers, travelling from Delhi. After a comfortable overnight bus ride, we reached Manali early in the morning the next day, where Aman picked all of us in SUVs to take us to our resort – Mountain Trail. This resort was not only beautiful but the view from here was breathtaking. One could see the entire Manali from here and it is away from the tourist’s hustle bustle. Cannot get better than this right? But it did. The organizers welcomed us with a beverage and surprised us by gifting every one of us the ‘Pahadi Topi’. We were overawed by their hospitality. I have a confession to make – I always wanted to buy one of these and travelling around the Himalayas wearing it was even more thrilling and made us feel that we belong in the mountains. Later that day, we explored Manali, hopped from one café to another, did zip lining, took a dip in the river while we were at it and partied till late night on live music. All of this was again arranged by High Mountains. They also gave all of us the High Mountains goodie bags, Tibetan flags for our bikes, T-Shirt with the Ladakh route and a water bottle. And well, just like that, we were well acclimatized after a day of fun and well prepared for our journey to the challenging weather of Ladakh. If you are planning to go Ladakh on your own and want to know a detailed itinerary and bus details, click the link – here. The next day, we left in SUVs to reach Jispa, in Keylong. Jispa was our camping spot where we stayed in ‘Jispa Journeys‘. The most comfortable yet the most beautiful site in which a camp could be located. We star gazed, tried capturing the star trails, woke up early in the morning to catch the sunrise and ran around in the green paddy fields. Jispa is really picturesque and the arrangements done by High Mountains were spectacular. The food was delicious and bonfire during the night made everything even more blissful. I hate to sound dramatic, but honestly, the ride from Jispa to reach Leh was difficult and challenging. Many of us got sick on the way and at Sarchu half of us were looking like zombies. Ha Ha! But the view made everything worth it. After leaving the Jispa village, you could witness a new landscape altogether which meant we were finally entering the barren land of Ladakh. Although we reached late at night to Leh, however, the entire ride was really beautiful. This was the day when the actual adventure began! Everyone was given their respective bikes (bullets mostly). SUVs were arranged for the people who opted for it and we all were off together to explore Leh. There were 21 bikes in total and since I was riding at the end as a pillion, it was a sight to see 21 bikes in a straight line. It was a different experience altogether. Aman was the one who was leading the entire group ahead and the first stop that he took us to was ‘Shanti Stupa’. From here we went to do the best adventure activity in the Indus river, rafting. Seeing Zanskar river and Indus river merge was perfect! It was thrilling to cross the rapids in such freezing waters making the experience unforgettable. We also witnessed the famous magic of the Magnetic Hill, felt proud in the Hall of Fame and ignited faith in the Gurudwara Pathar Sahib. It was another beautiful day in Ladakh and this was the day when we were finally getting to see the famous ‘3 Idiots’ shooting spot –Pangong Lake. Since ‘High Mountains’ prepared all of us well in advance for the challenging ride, we were well equipped with all the necessities. Some of us bought gumshoes to cross the mighty Changla Pass (5,360 m) – the second highest motorable road in the world. We also bought some rain covers and took jackets as we knew the weather would be nothing but challenging. The ride was bumpy, actually, very very bumpy. But Aman guided really well. He assigned a number to all the bikers respectively so that all of us are in sync and in a line. If a rider behind one of us slows down or is not under the vicinity, he informed all the other riders in front by blowing horns – a signal to stop. It gave me goosebumps in between seeing how well synced and coordinated everyone was. Also, being the only group with so many bikers did catch hold of a lot of attention on the road. Sometimes we stopped for tea and at times to click pictures. But what we did not know that we will encounter snow in Changla Pass. With such a severe cold and harsh weather, reaching Changla felt like an achievement in itself. 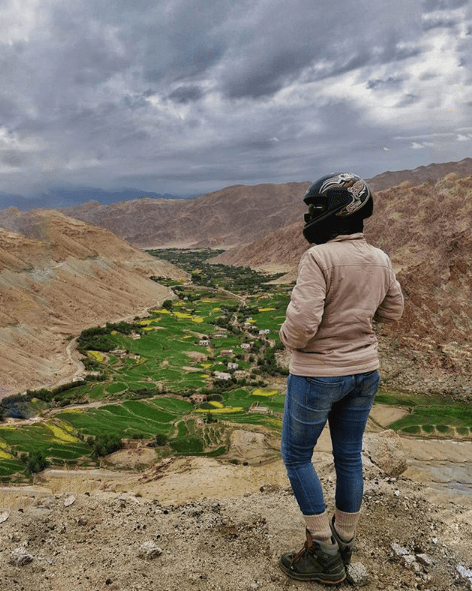 Changla made us realize why everyone should visit Ladakh on two-wheelers. The drive was challenging, adventurous and thrilling at the same time. Further, after crossing Changla Pass the roads get smooth with many bends and pins. It becomes an altogether different experience from here. And once we reached Pangong, all of us felt like we were in heaven. With good food and the lake right in front of our camps, all of us did not ask for anything more. Do not miss out on sunrise here. Get up at 4:30 AM! Oh, also, the next day when we left for Leh, we were greeted by snowfall! Yes! Imagine riding on the world’s second highest motorable road in severe snowfall where you cannot see what is ahead of you. Adventurous? Totally! Our next stop was the famous Nubra Valley, the cold dessert that has sand dunes at such a high altitude. The road to Nubra is really amazing. It was my best ride till date, and while we were a little late at reaching our cottage ‘Apple Cottage‘, it was still an experience to cherish. To reach Nubra, you will have to cross the world’s highest motorable road, Khardungla Pass and we spend a good hour at taking in the surroundings here. The cottage was amazing. It had no lack of amenities and leisure. High Mountains arranged for bonfire and music for all the travellers. Also, we shot milky way here and stared at it continuously from the cottage for two hours. We also rode on the double hump camels the next day, played cricket on the sand dunes and did some off-roading. While I thought Ladakh is only famous for its landscape, these adventurous activities were different and experience for me. And I am really grateful for it. On the last day, we left from Leh late at night which was a very wise decision because half of us covered half the distance while sleeping. We reached Manali on 10th July, rested, and then went to Jogni waterfalls, where we dived into the water and spent hours underneath the falls. Later during the night, we partied to the songs played by the DJ. We all were very hyped, satisfied and happy with how the trip panned out. I swear, it was commendable and really a great deal of an excellent effort made by High Mountains. The trip’s starting point is the Leh airport and the cost starts at INR 14,200/-, if you opt for an SUV. For biking tours, the charge is INR 17,400/-. The trip starts at the Volvo point of Delhi with a total duration of 11 nights and 12 days. By car, the charges are INR 28,100/- and on the other hand, the bike option is for INR 31,200/-. The costing is the same as that of ‘Delhi – Leh – Delhi’, but instead of Delhi, the trip ends in Srinagar. 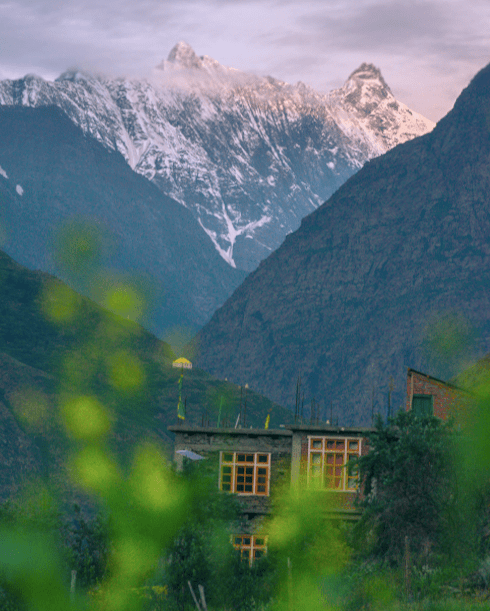 You can follow High Mountain on Instagram and Facebook to stay updated on any other trips coming in. If you are planning to experience Ladakh, blindly opt for High Mountains services and packages. They will make your trip worthwhile!